Gather up the family or that special someone and head on up to "The Gathering". 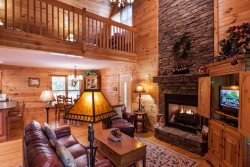 This stunning water front home is privately situated in the Coosawattee River Resort and sits right on the banks of Mountain Town Creek, one of the best known trout steams in North Georgia. Whether you've come for some much needed R&R or to try your luck at one of those trophy trout, rest assured, you are in for a treat! This home is beautifully appointed and has something for just about everyone. Of course being right on the water has it's advantages, one of which is the never ending music of the cool mountain waters. Enjoy a camp fire right at water's edge and roast a marshmallow or two. The beautifully landscaped yard provides a great place to enjoy some of the natural wildlife that inhabit the area and the luxurious hot tub is the perfect way to unwind after a long drive or a full day of exploring the area. Inside you will experience all the comforts of home including a 50" flat screen TV in the living room as well as a gas log fireplace for taking the chill off. The terrace level provides a game area complete with pool table, foosball table and another flat screen TV. Two Queen bedrooms on this level allow for privacy with the King Master being on the main level. This home was definitely created with comfort and beauty in mind and there is no doubt that you will be thrilled that you chose The Gathering to spend your mountain getaway! *This home is very close to "Building Memories", "Rockin' River" and "River Spirit". ** NIGHTLY RENTAL RATES ARE BASED ON 6 PEOPLE. THERE IS A FEE OF $15 PER PERSON PER NIGHT FOR EACH PERSON OVER 6 UP TO THE MAXIMUM QUANTITY. Wonderful! Great! Loved it! Coming back next year and possibly every year. The stay was great! We have stayed with other rental companies over the last four years and so far this is our best experience. The property was beautiful! Our kids loved it and no one was ready to leave at the end of our stay. Very very clean ! Everything that is needed to feel at home was provided in the cabin! The kids had a blast by indoor pool table and table soccer! The out door space was exceptional and private to enjoy quite time ! The beds were comfortable to sleep on! Plenty of space to lounge around and watch tv when we couldnt go out to play! We enjoyed every day of the vacation and will be returning soon! Nice relaxing getaway. Easy way to relax and enjoy nature with your family. Service was great from informatiob gathering through check out. They give you a real nice supply of the basics you need when you arrive. Dont require you to do much on checkout like some places will.